The hand must be used on this HANDLE for this to work!!! the new version might need longer bolts but the handle will still work fine. The Starbound Observing Chair is accepted as one of the best Observing chairs on the market. With a 9" to 32" adjusting range, what else could you want? If you have this chair, you may have discovered as I did, that if you touch the front edge while not sitting on it, the seat is likely to take off towards the bottom, like the bird on a rod toy, bouncy, bouncy, bouncy…'till it has reached the bottom. Yes it is more difficult to adjust its position than is necessary. an excerpt from a removed link weasner.com/etx/showcase/starbound_chair/chair---> There is one thing that takes some getting used to: many of us tend to move the chair we are sitting on by lifting up on the edges of the seat. You don't want to do that with the Starbound Observing Chair, because the seat will slide. If you are sitting on the seat when you lift it up, the seat, with you on it, will go down. Fast. This could be embarrassing if someone saw you or dangerous to the health of your telescope or your body if you fall. Be certain you tell anyone sitting at your telescope about this. You don't want them sliding down the rails. Also, it is possible to lose your hold on the seat front when lifting it upwards to release the friction on the roller. If you do, the seat will slide rapidly down the rails. So it is necessary to get a good grip on the seat cushion before repositioning the seat. Once you get used to moving the chair by the support structure and lifting the seat front to slide it up or down, you will find it a pleasure to use. I am. Oceanside sent me a unique add-on for the Starbound Observing Chair that is made by a local astronomy club member. 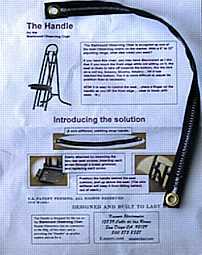 Made by Kasner Electronics, "The Handle" ($9.99) adds a "wire stiffened" strap that is secured to the seat bottom using two of the screws that hold the seat cushion to its frame. The strap goes a long ways to overcoming the problem mentioned above about moving the seat to different heights. You reach behind you with one hand and hold the strap; with the other hand you lift the front of the seat upwards. Then you can easily raise and lower the seat without it slipping out of the hand holding the seat front.